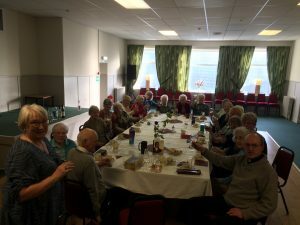 The Friendship Club meets every second Tuesday of the month in the Catholic Church Hall in Hawick at 1.30pm to 3.30pm. The group at the moment are all retired members, but any age group is very welcome. We advertise in the weekly Newsletter at St Mary and St David’s therefore most members are parishioners but they also bring friends and relatives that are not. We have a varied syllabus from arts and crafts to talks and videos that the members request we also celebrate with a party at Christmas, St Andrews and Burn’s Suppers. There are about sixteen members so we have a great chat and enjoy each others company a great deal. The word Friendship really means great friends that have a laugh together and support each other, which is wonderful. Please contact Elizabeth Jackson at 01450 372511 or just pop in, we look forward to seeing you.